It will be October on Monday and already the farm is showing signs of a golden autumn. The Sweet Chestnut trees are beginning to drop their fruit which is larger than normal this year but still not fully ripened. David Proctor writes about Fordhall’s Sweet Chesnuts and why they don’t produce ripe chesnuts ready to eat. There are two outstanding examples of Sweet Chestnut (Castanea Sativa) located on the nature trail past the community garden and the pigs and then continuing on the way to the Forest School area. They are also known as Spanish Chestnuts being natural to the mountains of Southern Europe and have been grown in Britain since Roman times. the broad trunk of the Sweet Chestnut is scaly, brown and has deep spiral fissures unlike the Horse Chestnut which has non-fissured greyish or brown flaky bark. 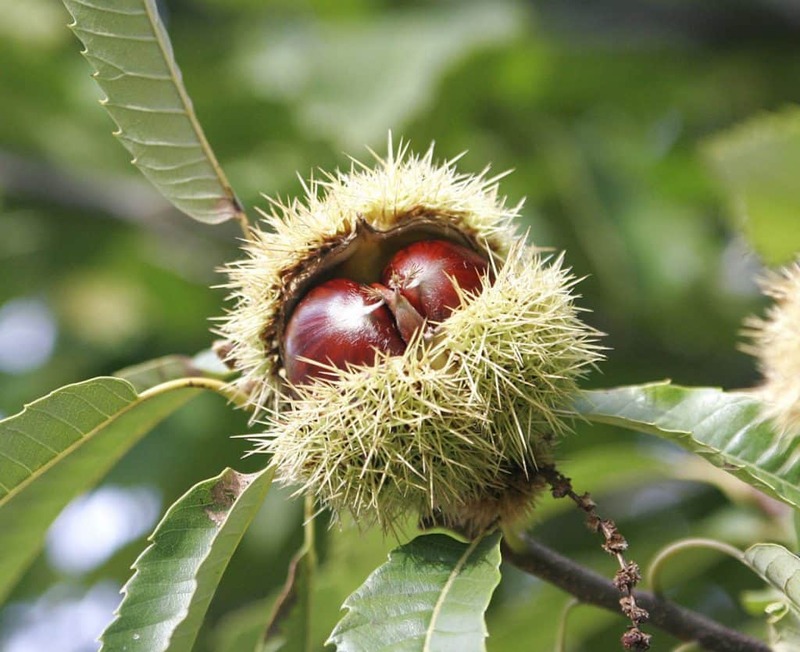 The sweet Chestnut can reach up to 115ft, slightly less than the Horse Chestnut’s 130ft. its leaves are three inches long, spear-shaped and have deeply saw-toothed edges whereas Horse Chestnuts have compound leaves of five to seven leaflets with smaller saw-toothed edges on a single long stalk. The flowers of the sweet Chestnut have a sickly scent with pale creamy yellow male flowers along the catkin and a few green female flowers at its base producing one to three nuts in a case which has many more spikes than the Horse Chestnut’s conker containing case. British summers are not hot enough for the nuts to ripen to full size and therefore most of the chestnuts eaten here are imported from Southern Europe. A major redeeming feature of the Sweet Chestnut is the way it is ideal for coppicing, whereby it can be cut to the ground every twelve to fourteen years in order to provide fencing paling. The larger of the two trees at Fordhall is a perfect example of this as since it was coppiced many years ago it has now got six separate trunks, each large enough to be a tree in its own right. This year’s crop of chestnuts has every appearance of maintain the usual high standard at Fordhall. Why don’t you make a visit to Fordhall and see it in all it’s autumn glory.